Our unique, naturally flavored olive oils have long been a specialty of Fratelli Mantova. In fact, we were the first to develop flavored oils for the market more than 30 years ago. We have been infusing extra virgin olive oil with a variety of exciting flavors ever since. They are made from real Italian olives, pressed, and bottled in Italy. But, it would not be a "real Italian" product without the Italian art of taste selection and blending. That is why Adriano Mantova, with his over 25 years of in-family experience and tradition, personally tastes hundreds of samples from all over Italy to select the ones that will meet his standards. Our line features balanced blends of herbs, spices, and other natural flavor extracts in high-quality 100% Italian extra virgin olive oil. Designed to make cooking your favorite dishes easy and delicious. Use these flavored oils to enliven salads, dips, meat, seafood, grilled entrees, sauces, pizza, pasta, and much more. 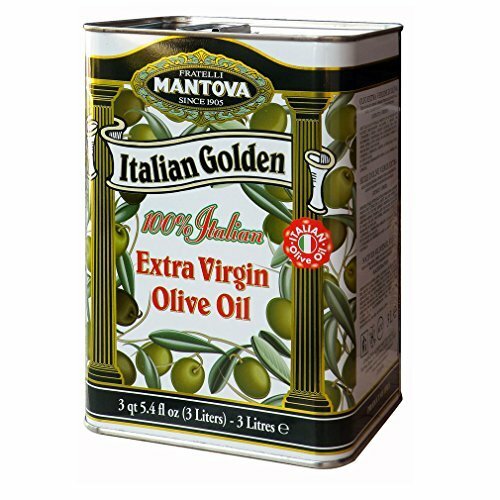 HEALTHY DIET: Mantova Italian Golden Olive Oil is a naturally trans fat and cholesterol free product. Olive oil has been shown to support a healthy cardiovascular system. This single ingredient oil is gluten free, GMO free, and sodium free. The addition of heart-healthy, authentic organic extra virgin olive oil to your nutritious diet supports your body's systems for optimal performance so you can live your best life. DELICIOUS FLAVOR: The Mantova Family is committed to the highest quality Italian grown ingredients. We take pride in what we do and offer this product which has a bold, delicious flavor and low acidity. Our organic extra virgin olive oil has a smooth flavor profile with hints of sweet almond flavor and delicate, mellow body. PERFECT FOR EVERYDAY: This first cold-pressed extra virgin olive oil is perfect for everyday use in the kitchen and at the table. Great tasting for dipping, dressings, marinating, or pan sautéing. Utilize this delicious, organic olive oil for all of your culinary needs and add heart-healthy flavonoids to all of your family's favorite dishes. If you have any questions about this product by Mantova, contact us by completing and submitting the form below. If you are looking for a specif part number, please include it with your message.